Along with George Hatch, Thomas How was one of the property owners to donate land for the Fort Hill Cemetery. A lawyer by trade, records have his last name spelled "How" as well as "Howe". Mr. How was one of the original twelve Trustees on the Fort Hill Cemetery board. HOWE, Thomas Y., Jr., a Representative from New York; born in Auburn, N.Y., in 1801; completed preparatory studies; inspector of Auburn Prison 1834-1838; elected surrogate of Cayuga County and served from March 18, 1836, to April 14, 1840; elected as a Democrat to the Thirty-second Congress (March 4, 1851-March 3, 1853); mayor of Auburn, N.Y., from March 1853 to March 1854. 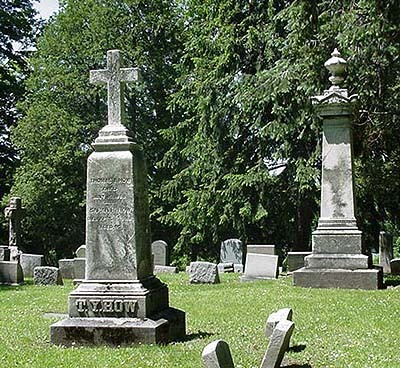 The How family lot is in the North Side section of the Cemetery.